Free Practice 1 + 2: In both free practice sessions the Kaufmann Drivers had been very quick. In the second session it was Kevin Jörg who set the fastest laptime ahead of his teammates Delétraz on P 2 and Vanthoor on P 3. Mazepin was on P 6. 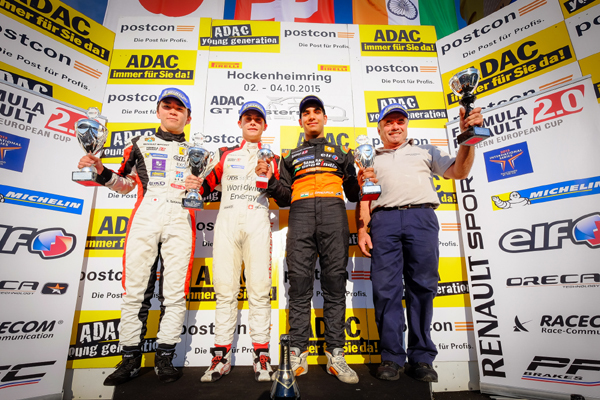 Qualifying 1 + 2: In the first qualifying which set the starting order for Race 1 and Race 3, it was Louis Delétraz who took both Pole-Positions. 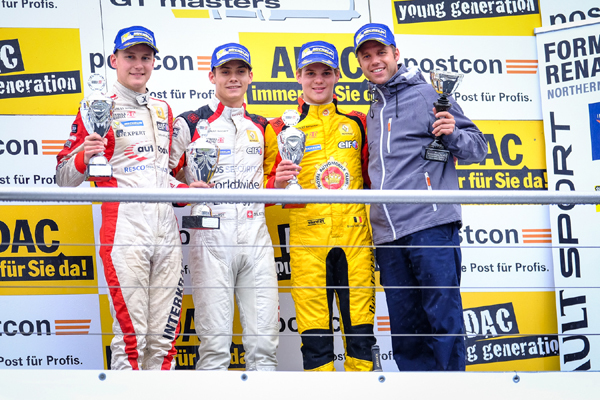 Kevin Jörg took P 2 and P 3. Dries Vanthoor was on P 6 and P 5. Nikita Mazepin took P 10 and P 9. In the second qualifying it was again Pole-Position for Louis Delétraz, ahead of teammate Kevin Jörg, Dries Vanthoor on P 4 and Nikita Mazepin on P 9. Race 1: In the first race Mazepin drove pretty strong and was able to finish on P 6. Dries Vanthoor drove very well also and finished P 5 before a 10-seconds time penalty for jump start dropped him to P 9. Kevin Jörg had a poor opening lap and dropped to P 4. Even driving the fastest race laps he could overtake. In the lead Louis Delétraz was pulling away from the rest of the field taking a dominant win. Race 2: In the second race on Sunday morning it was raining and the race was started behind the Safety Car. 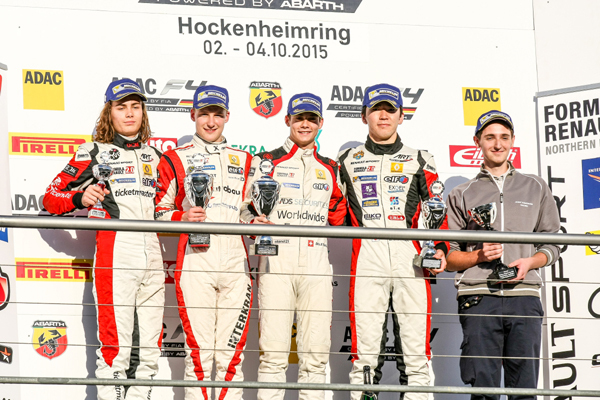 After the race was started it was all Kaufmann Drivers in the front. Delétraz leading Jörg, Vanthoor and Mazepin. Unfortunately Mazepin crashed due to a mistake. In the front, Louis Delétraz was leading his teammates Kevin Jörg and Dries Vanthoor to another Kaufmann 1-2-3 during this year´s NEC season. An amazing success once more. Race 3: The final race on Sunday afternoon was in dry conditions again. Mazepin had to make a pit stop after a contact and finished on P 18. Vanthoor, who suffered some damage on his car due to some contacts as well, dropped to P 8 in the end. In the front once more Louis Delétraz was leading Kevin Jörg. 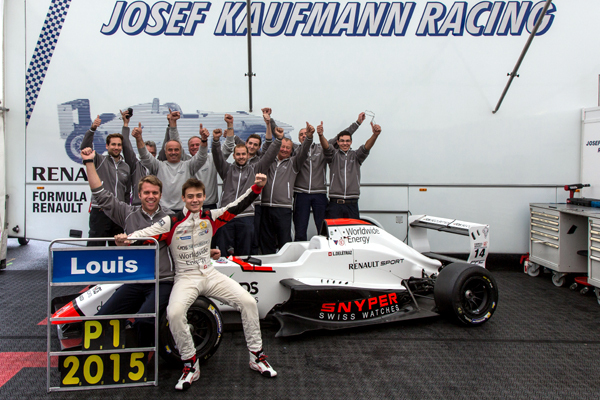 Both Kaufmann Drivers pulled away from the rest of the field finish the season with another Kaufmann 1-2. 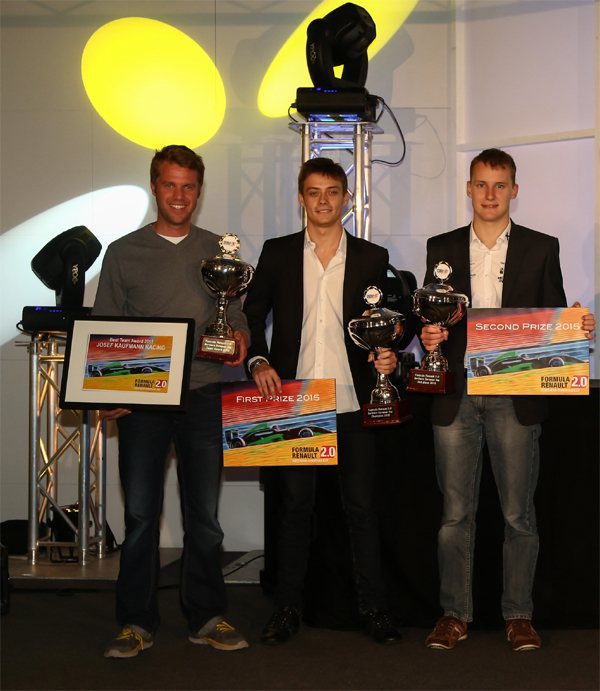 With 9 victories Louis Delétraz took the 2015 Formula Renault 2.0 NEC Title ahead of teammate Kevin Jörg who became Vice-Champion. The Team of Josef Kaufmann Racing won as well the 2015 Formula Renault 2.0 NEC Team Championship. An amazing year for the whole Team.